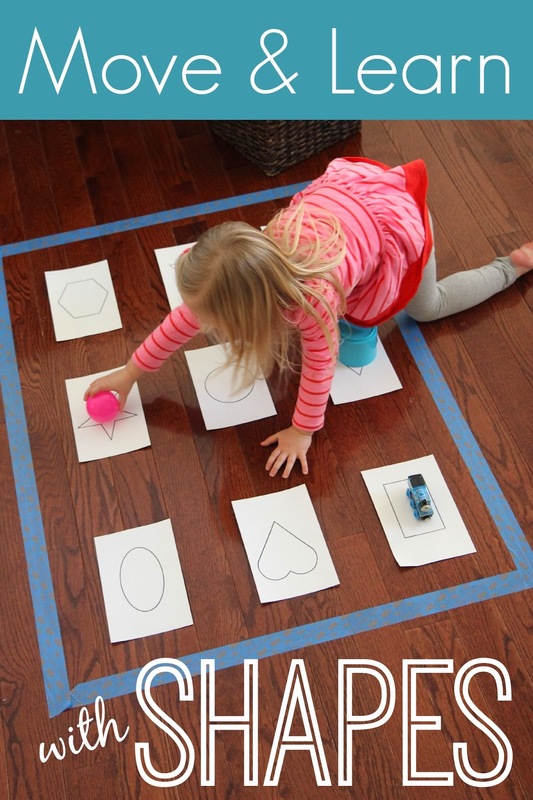 I love using simple games to get my kids moving, learning, and having fun. Learning Resources sent me a free set of Pop Games for Preschoolers and we've been loving playing with them and incorporating them into our learning activities! 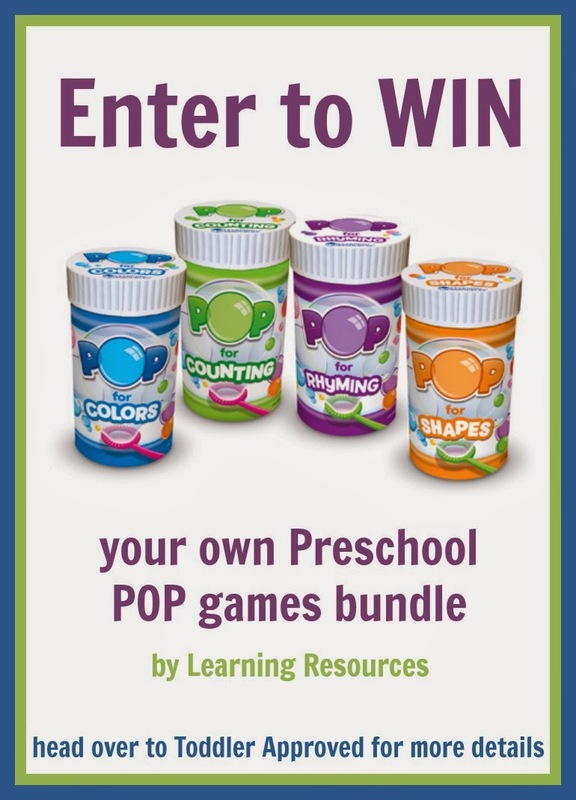 In the Preschool Pop Games Bundle there are four simple pop games to play. Each set focuses on a different concept... colors, shapes, counting, and rhyming. To break in our Pop games we decided to use them to come up with a few Move and Learn activities. Today we'll be focusing on the Pop for shapes game since that was the favorite of the four games during our little preschool last week. 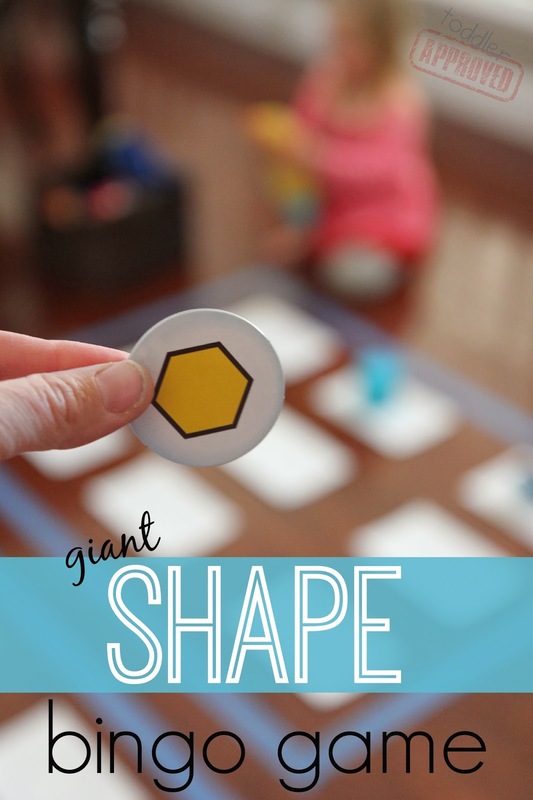 Our first Pop for shapes game activity was a Giant Shape Game. We scattered cut out shapes on the floor around the room and taped them to the floor using painters tape. Then each child got to pull a bubble card out of the container and say the shape they saw! Once they said the name of the shape they got to run around the room and match the card to the large shape on the floor... kind of like we did in our Tape Shape Matching Game. Next we went on a Shape Hunt. Each child got to pull a bubble card out of the Pop game container, say the name of the shape, and then all of the kids got to go on a hunt around the playroom to find an object that had that same shape. Everyone worked together!! Sometimes the kids even used several objects to make the shape. For our last activity we played a Giant Shape Bingo Game. We used painters tape to make the outlines of two bingo boards on the floor and we put paper shapes inside each bingo board rectangle. You can download my free printable shapes here. I have included 8 shapes that were in the Pop games. I printed the shapes out so that there were two on each page and then I cut the pages in half. As an adult pulled out a bubble card from the container, the kids had to say the shape name, and then go put a marker (beanbag or toy) on top of that shape on their bingo board. Once they got three in a row then they yelled BINGO! The baby had so much fun helping to pull the cards out and show them to the big kids. These cute Preschool Pop games from Learning Resources are super easy to play, easy to store, and just look fun. As soon as my kids saw the set they wanted to play with them right then. My little preschool students felt the same way. open-endedness of the product... you really could use them for all sorts of other activities besides just Pop games (even just as simple manipulatives). Today I am excited to give one Toddler Approved reader the opportunity to win their own Learning Resources Preschool Pop Games Bundle. Make sure to fill in the rafflecopter giveaway entry below and complete the mandatory email entry. You can get up to twelve entries by completing all tasks mentioned in the rafflecopter form below. Some earn you more entries than others. The winning entry will be drawn on Tuesday, January 28th. I will notify the winner via email. The winner will need to reply to me within 72 hours of my email. If there is no response, a new winner will be drawn. See our Official Giveaway Rules for complete guidelines. US Residents only. Disclosure: This post is sponsored by Learning Resources. We love Learning Resources!! My 2 year old daughter loves the food and basket color sorting set, and my 5 year old son has loved the crocodile hop floor game. I love that their products are enticing, realistic, and durable. Thanks for the giveaway!! These pictures are priceless - especially the Bingo one! I am loving the trifacta game for older children. I love all of their great products. The shape sorting cupcakes would be a big hit at my house!! The shape sorting cupcakes would be a big hit at my house!!! No way to pick just one. These look like great games! These are so cute!! What a great ida. I love the pretend food they have too. My favorite is the Crocodile Hop™ Floor Game. Thanks for the wonderful giveaway! Right now my daughters favorite toy from Learning resources is the count & sort bears. Two of the toys I saw today that both of my toddlers would like is the smart snacks counting cookies and the ready, set, move classroom activity. But that was hard to narrow down and can't just choose a few. Thanks for sharing this neat idea! My son would love those food kits. He's definitely into his own play food right now. For toddlers pop games are very effective for learning. I really like such educational set. Thanks for providing some genuine information regarding that language learning set. We are looking at the scale. Very nice. I like the counting cookies. My two year old would have a lot of fun with that. I like the counting cookies. My two year old would really like that. Right now we are loving all things Gears Gears Gears and the Primary Science Lab set. My son really likes the gears sets.